The tips in this article will help you to achieve and increase your visibility on Google for local searches, thereby attracting more potential customers to your business. Years ago, when people wanted to find a particular product, service, or business in their area, they would go to the Yellow Pages. Today, people have tossed aside those clunky books and turned to online searches—Yelp, Bing, Angie’s List, but most commonly Google and Google Maps. Whether they’re looking for a restaurant, flower shop, or tattoo parlor, consumers want to be able to quickly find what they need, nearby. Google is revolutionizing search in that consumers are increasingly able to get what they’re searching for directly from the results page, without even having to click through to a website. That being said, if you want to improve your online visibility and get ranking on Google, you need to align your website and local listings with Google’s ways. The term for this is local SEO. 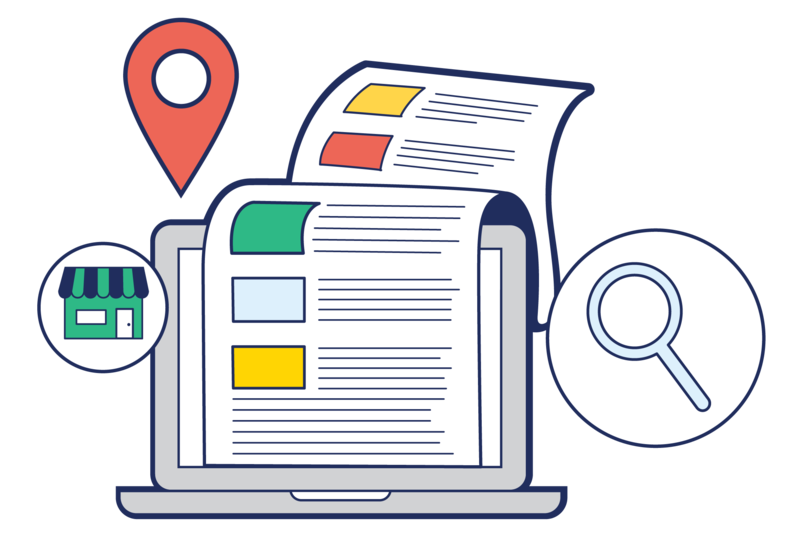 Local SEO refers to the various tactics that will get your business website and listings to show up for location-based searches, and also in the local results for broader searches (such as Google’s Local Pack). How Does Local SEO Help with Visibility? Striving to show up for broad searches related to your industry puts you in a much larger pool of competition including big brands and high authority institutions. Targeting searches more specific to your location will increase your chances of not only showing up, but also showing up for the people most likely to visit and engage with your website. Local SEO helps to increase your visibility in a way that will impact your business’s bottom line. Having a website is a must for local SEO, but a Google My Business Listing is becoming equally as, if not more, important. Your Google My Business listing influences your visibility on more than just Google. Get your Google My Business Profile set up and verified as soon as possible if you want to get more exposure on Google. As mobile internet usage now surpasses desktop, and as many local searches are conducted from mobile devices (think, “Chinese food near me”) Google gives preference to websites that are mobile-friendly. However, user experience is a major factor in ranking. If users have to pinch and zoom, face slow load times, or can’t quickly find the information they’re looking for, Google will not favor you in local results. Make sure the experience of discovering, learning about, and contacting your business is as seamless on mobile as it is on desktop. Ideally, you should have a responsive website that displays and functions consistently across any device. Your Google My Business profile also makes your business local- and mobile-optimized. As mentioned above, directory listings are a key component of local SEO and increasing your search visibility. Listings are virtual profiles of your business that contain key details such as the name of your business, phone number, address, website, and any other pertinent information. In addition to Google My Business, you should get listed on other major directories such as Yelp and Angie’s List. These listings will help your business to show up in smaller niche directories. The more directories your business is consistently listed under, the more visibility you will have online. With the above SEO channels created, you are now ready to start employing local SEO tactics. These tactics involve location-based keywords, location tags, and consistency. 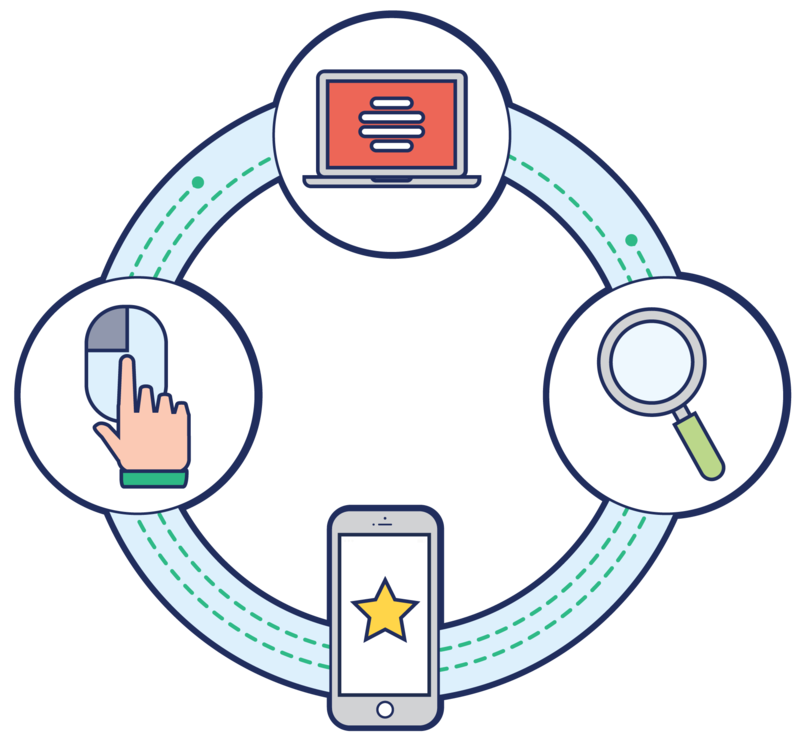 When describing your products and services, attach location-based modifiers to those keywords in your listings, social media profiles, and website pages. Geographically-related keywords should be placed in the titles, headers, image tags, body, and meta descriptions of your website pages in order to increase your local visibility. Put yourself in the shoes of a potential customer in your niche. Ask yourself what their biggest priorities are, and what they would likely search for. Knowing your customer is the best way to market your business to customers. Beyond just brainstorming ideas, there are a number of online tools you can use such as Google Trends, Soovle, and Answer the Public. This tool allows you to look at the number of searches for a particular keyword over time. You can even narrow down the geographic location and length of time to get a more accurate reading. Soovle lets you see what other things people are searching when they type in certain words such as “flower shop in Louisville” or “exotic flower shop downtown Louisville”. By finding the words that are searched together, you can use those terms as targeted keywords in your website content. Answer the Public is another free keyword research tool that generates words and phrases based on the auto-suggest results from Google and Bing. Your social media profiles do not show up in Google searches, but you can strive to show up first in location-based searches being performed on social media, such as with Facebook. Make sure all location-based fields in your social media profiles are filled out. Create a location for your business so that you—and your followers—can tag your business in Facebook and Instagram posts. This will amplify your visibility through your followers’ networks. Another way people can perform location-based searches online is through hashtags. A person looking for a tasty late-morning meal can easily find a nearby spot by searching #bestbrunchboston on Instagram. Once again, social media doesn’t directly impact your local SEO, but it does send local signals to Google that may strengthen your local visibility. It’s not enough to just get set up in online directories and social media profiles. Taking the time to ensure uniformity across all of your online entities can mean the difference between showing up first and last in search results. For example, don’t use the title ‘Sweet Shoppe’ on Yelp and ‘The Sweet Shoppe’ on your Google My Business listing. Not only does this hinder your local SEO, but it also confuses potential customers. The more consistent your information is across listings, the more Google can trust you and the more visible it will make you. In most cases, your business name will be unique enough to stand apart from other businesses. However, if your restaurant is named ‘Mickey’s’ you may find yourself competing with a plethora of other ‘Mickey’s’ out there. You might want to list your restaurant in databases as ‘Mickey’s Irish Pub Chicago’. Not only will this differentiate your business, but will also make you more visible for searches like ‘Irish Pub’s in ‘Chicago’. Once again, make sure that if this is the name you choose, you use it across all platforms. Authentic content related to your industry is foundational to SEO of any kind. For local businesses, however, locally relevant content should also be a part of your content strategy. For example, if you’re a locksmith in Dorchester, you could write a blog post entitled “5 Ways to Keep Your Home Safe in Dorchester”. Yoga professionals could publish a post such as “Top 10 Natural Food Stores in the Bay Area”. Also, you should include information about local events and area partnerships, as this will help to draw in local users and enhance your local visibility. Google understands that to be most useful to its users, it needs to give them accurate information they can rely on to choose which business to engage with. The more customer reviews you have (ideally, positive reviews), the more visible you will become in search results and feeds. A hallmark goal of local SEO is to show up on Google’s local pack. The local pack is the map section that appears, when relevant, in the results page of a regular Google search—in particular, below the first three results (which are paid ads) and above the organic results. For more help with optimizing your Google My Business profile, use our free Google My Business tool or sign up for a free one-on-one session below.